Fat Tuesday in India | Walk with us! Taking a “Thank you” picture for the benefactor who donated the grill to the formation community. Lent began at the stroke of midnight just about the time the brothers came up the drive from their night out on the town. 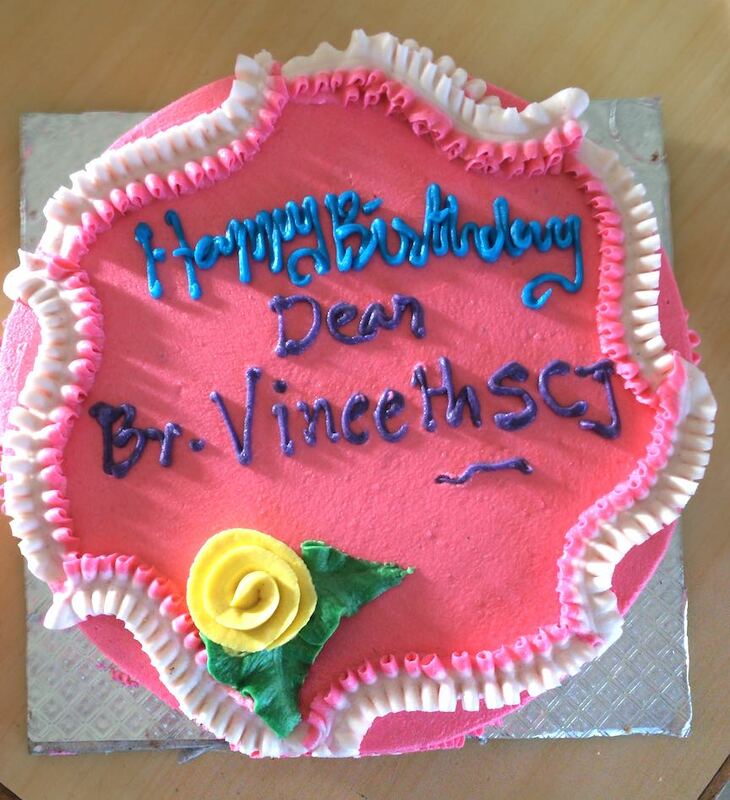 The day started early with birthday greetings to Br. Vineeth, who celebrated his 26th birthday on Fat Tuesday. Since there are no local customs connected with the day before Lent we began our own last year. I did learn that there is a carnival in Goa just before the start of Lent lasting three days. I suspect that Portuguese influence can be credited with creating that local Goan custom. Our own pre-Lenten doings lasted two days. 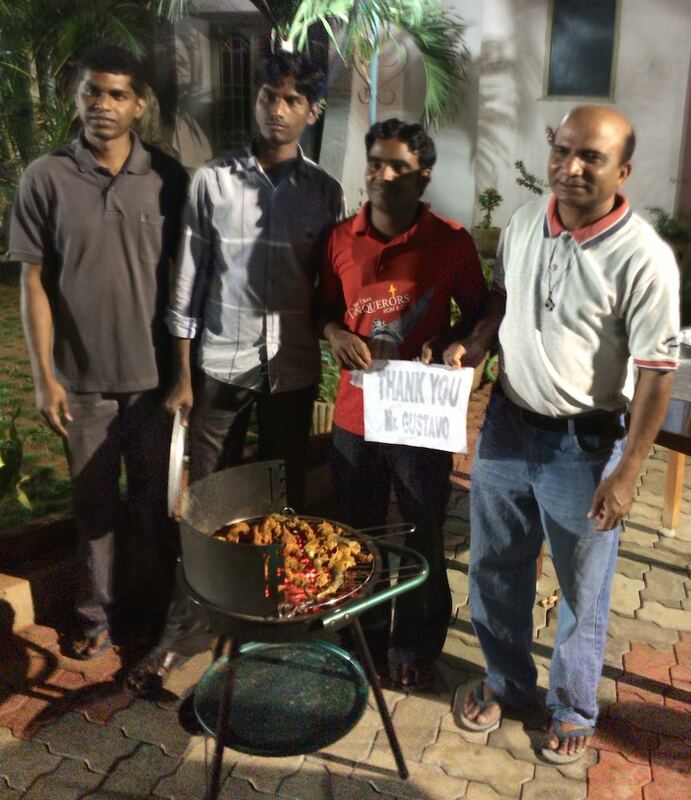 It began on Monday evening with a barbecue prepared by Fr. Mariano. Originally this was supposed to take place when the novices and postulants were here for their cricket match but that didn’t work so instead it was scheduled for Monday evening. It marked the inauguration of the community grill, a gift of a friend of Fr. Mariano’s from Germany. Our meal was delayed by about 30 minutes while the charcoal was being made. No bag of charcoal from the local 7-11 or supermarket chain! Instead, some of the brothers used excess wood to make their own. Of course rice was featured along with grilled beef and grilled tuna. It took some doing but Fr. Mariano finally found mayo in Vijayawada which he used to make a tuna salad as well. Fat Tuesday began with a birthday cake! You might say the barbecue was a warm-up to Tuesday’s doings. That, as already noted, began with the breakfast birthday greetings to Br. Vineeth along with the traditional cutting of the cake with the house superior feeding a morsel to Vineeth and he in turn to Fr. Mariano. This is a wedding custom in the States but here it is done on many special occasions. In the evening we all squeezed into our minivan, jeep and bike to head off to the Pizza Company, the only pizza joint in all of Eluru. We began this custom last year as a way of celebrating Fat Tuesday: pizza and ice cream! While we were waiting to get our tables the brothers lobbied Fr. Mariano that they should all go to the nearby cinema after dinner for the 9:00 pm showing of a Telugu film. With Lent starting in a few hours going to the movies would be out of the question and apparently it’s been a long time since last they set foot in the local movie house. So off they went, enjoying the last of Fat Tuesday celebrations before Lent would begin. Despite the late night, all were up and at ’em at 6 am for morning prayers followed by a trip to the Brothers of the Holy Family where both communities shared the opening of Lent with Mass and ashes.